Kinshasa, Democratic Republic of the Congo – A poll official confirmed on Saturday that the Democratic Republic of the Congo will be elected in the northeast of the country on December 30 in Ebola, even though there are fears that inaugural polls there will lead to new cases of the virus could lead.
. "The election centers have not changed, we have the election centers in the Ebola – affected areas, because the Ministry of Health did not see any specific need to relocate." Kalamba told Al Jazeera. According to the World Health Organization (WHO), since November 28, there have been more than 500 confirmed cases of the deadly virus in the provinces of North Kivu and Ituri. The Democratic Republic of the Congo's Ministry of Health said that action has been taken to ensure that coordination in the region takes place without any problems. This includes having all voters wash their hands before and after voting. "Ministry of Health officials were involved in the fight against Ebola in the affected areas," a spokeswoman for the Ministry of Health told Al Jazeera. "A risk we must take"
Many voters in the region said Al Jazeera that the threat of illness would not prevent her from casting her vote. "We know that Ebola is here, but this is not an obstacle for us to vote and vote on December 30:" Kambale Kaputo, a civil servant in the city of Beni in North Kivu province, told Al Jazeera by phone. Awareness of Ebola We have been given measures to protect ourselves, and that helps We always interfere in churches in which Work and markets, we will go and vote, it is a risk, but we must go there. "The 50-year-old added. Christian Batenahe, a teacher from Beni, said that nothing would prevent him from taking part in the elections. 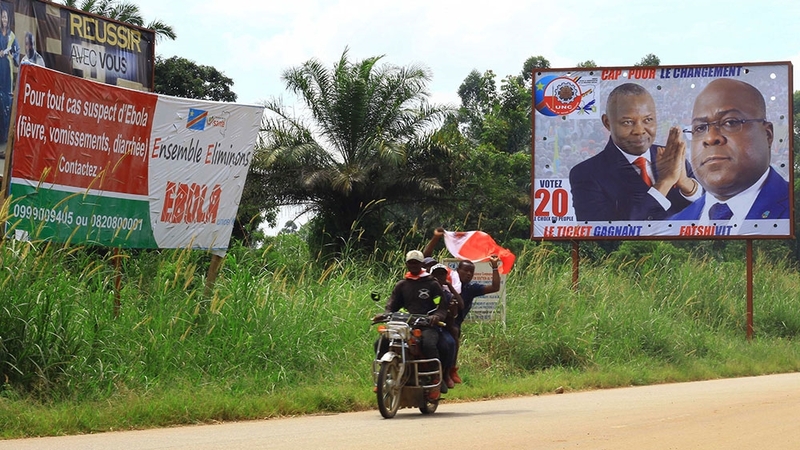 "We are not worried at all, we will vote on December 30 because it is everyone's right Congolese should go and vote Ebola will not stop us," said Batenahe. "Nobody is afraid of Ebola here in Beni, we know that people are dying from this disease, but those who stay have to vote for a change to this country," the 33-year-old added. More than 46 million people have registered to participate in the long-delayed poll in the mineral-rich country of Central Africa. The first elections were to take place in 2016, but were delayed because the electoral authority said that they did not have the necessary voting power. On Thursday, CENI postponed the vote following a fire that destroyed the vote on December 30 machines in one of its main warehouses in the capital, Kinshasa. The blaze destroyed nearly 80 percent of the city's 10,000 voting machines, which account for about 15 percent of the nation's voters. Officials also cited the Ebola outbreak in its delay of election. The fiercely contested elections are designed to select a successor to President Joseph Kabila, who has retired after 18 years in power. Twenty-one candidates compete for the country's first job. The Democratic Republic of the Congo, a country of more than 80 million people, has not experienced a peaceful change of power since independence from Belgium in 1960.